(Newser) – A North Carolina teenager died one of the most horrific workplace deaths imaginable on his first day on the job. Mason Cox, 19, died on Saturday after being pulled feet-first into a wood chipper, police in Kings Mountain say. WSOC reports that co-workers who had been cutting down trees in a yard were so distressed by the sight of Cox's body that they ran around ripping off their gloves and hats, causing neighbors to think that they were being attacked by bees. Police say John Crawford (some sources have him listed as Jon Crawford), the owner of Crawford's Tree and Stump Grinding Service, was hospitalized after having a heart attack at the scene, the station reports. 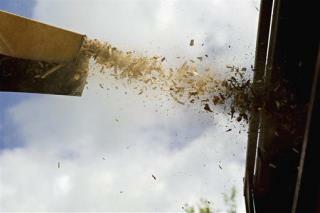 This just in..... Obama scheduled to hold a news conference to announce executive action for background checks and waiting periods for all wood chipper purchases. Quoting an unnamed official, the Obama administration said "wood chippers are no different than guns - both kill"
"Cox apparently became caught in the machine when he tried to kick a tree limb inside and his clothing snagged." Might be just as easily replaced that with "stepped in the swimming pool with a plugged in fan", "tried to beat the speeding train at the crossing", or "downed 50 tequila shots in 30 minutes". Thinning the herd, since you can't fix stupid.